I awake one more time with a face full of yoke-yellow inner tent. A few drops of rain had smashed hopes of a night under the stars. Hydrophobia, common to rabid dogs and the owners of down bags who've left their bivvy bags at home, had motivated some late-night high-speed pitching. The fun didn't end there either. I'd moved back indoors to find my attempt at the intrepid had been rewarded with a puncture. A sickening hiss, a cold sensation at the hip and shoulder, some heavy swearing and a field repair had helped while away my last night in the field. I crawl out of the tent a wizened old man. A cup of Randulfs strong coffee starts my heart. I decide that coffee grounds, like duct tape and super glue, should be part off all field repair kits. I notice that I've now fallen into the routine of a longer trip. Breakfast is consumed, packs get packed, tents get struck. All of it rhythmic and without undue effort. The ground-hog-day, good not bad, that backpacking days converge to. On short trips I don’t always get there. This time out I get there on the last day. Just in time for the jiggity-jig of the homeward leg. We stride out of camp under blue skies. 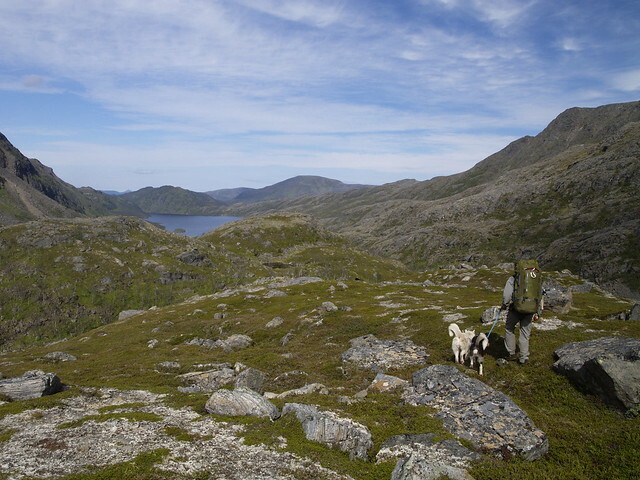 Heading roughly North-West, aiming for Ovrevatnet, covering ground I’d reccied the night before. This is the easy bit. We can be sure of a good line. Randulf is once again handling both dogs. In less than half a kilometre we cross the watershed and are dropping into the Stuorajarvaggi. The descent is easy. Nowhere too steep and always with views to distract. Backpackings paydirt. This valley seems different to the others. Softer somehow. 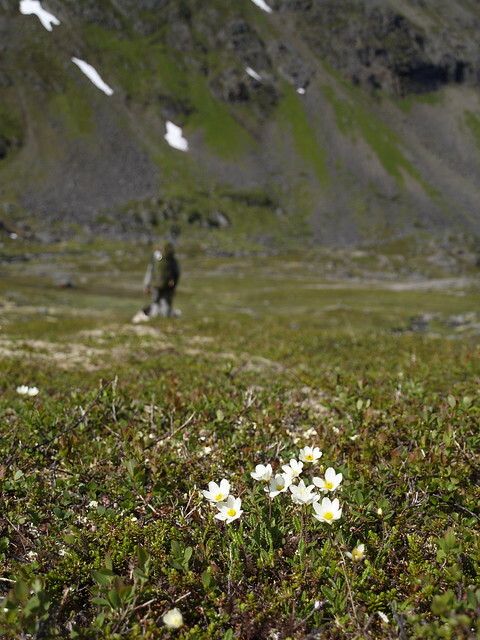 We cross a carpet of greener green, lush by comparison with what we’ve seen so far, studded with flowers. The flowers give the game away though. They’re the same ones I know from the South, except in miniature, their size testament to the short summer season and the long hard months preceding it. We decide that this would make a great base camp for an extended trip to explore the parks interior. You could get here by canoe by way of Storvatnet and Ovrevatnet packing in all you could need for a couple of weeks. 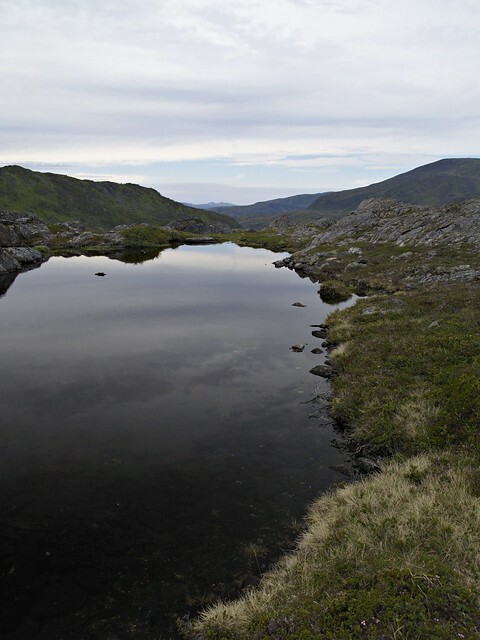 The Ovrevatnet is another gem. Long and narrow with one ruler-straight shore and squeezed into an unfeasibly narrow valley. At first sight it’s hard to envisage passing through without a boat. The Western shore is flanked by a rise just shy of 600m over a run of around a half a kilometre. To all intents and purposes, to the backpacker, it might as well be vertical. The eastern shore offers better potential but a spur, running down from the heights of Suolorassa, dips its toe in the head of the lake. From here it looks hard to negotiate. As we press on down I hope that a new perspective will change my outlook but is doesn’t happen. 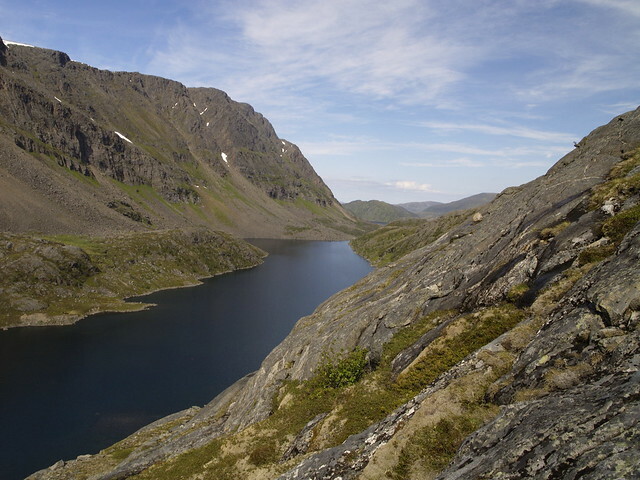 The red line of the suggested route stays high above the lake crossing the spur at the 225m contour. We decide to go with the suggestion and start to climb. A little toil puts us on top of the spur but once over the top we’re confronted by a steep complex slope, a series of grassy terraces separated by rocky steps. The hillside is convex and although we can see enough to work out our next move we can’t see far enough to plan a route down. We start down with caution, the dogs once again adding spice to the proceedings. A couple of steps lower I decide to try and make some ground on Randulf and the dogs, hoping that from the base of the thing I’ll be able to spot them down. A series of random left-right decisions sees me on steeper ground, wet underfoot and slippery under my soles. I pick my way down, on occasion utilising my arse to generate valuable extra friction. At times, if you count both cheeks, maintaining five points of contact. By the time I’m down the pack are already at the bottom. We see our mistake immediately, the route around the headland is passable right at the lake shore. Next time we’ll do it differently. A pause and a glance at the map tells us what we have in store. Between us and the car there are seven or more kilometres of perpetual rise and fall, all of it over a mixture of fellside and scrubby vegetation. I run my finger over the intricate ridge of Suolorassa and wonder if we would have been better staying high. False optimism perhaps given the nature of the high ground we’ve encountered in days previous. Up and down, up and down we go as the hardest day so far unfolds. The skies stay clear however and each rise brings new reward: long views of sea and rugged fell with powder blue, cloud streaked heavens. The near field an intricate cameo of vegetation and still water. The light is perfect. A landscapers heaven. It’s hard to find fault with this little island. We move deliberately, at a steady pace, pulling up the inclines and catching breath when mood and view demand. As we approach Storvatnet wetter going and stands of silver birch demand more detour. We pause for a food break. Insects are bothersome here. I thank my stars we’ve camped higher these last nights. We discuss our options. Another night out near to the car or push hard to make the last boat. The latter comes with the promise of a beer and home cooked food. The ayes have it. Beer works its magic on me once again. After the break we push harder. Bearing a few degrees East of the suggested route we work our way onto higher ground and across the shoulder of Glimmerfjellet and enjoy our last taste of open fell. 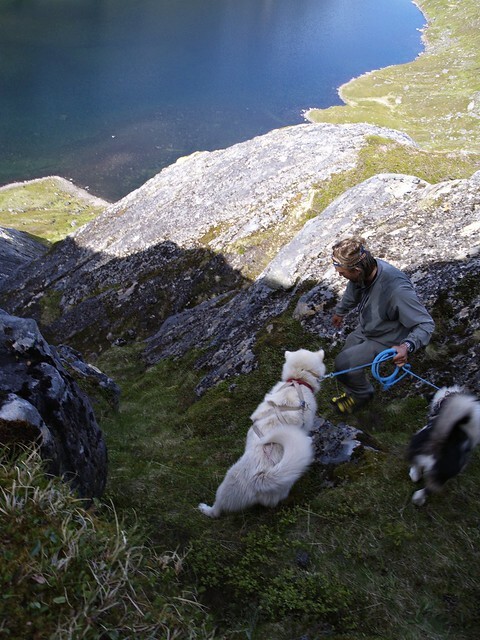 I fall back a little and watch Randulf weave through the terrain with both dogs on the line. Man, dog, wilderness. There’s gloriously primative about the scene. 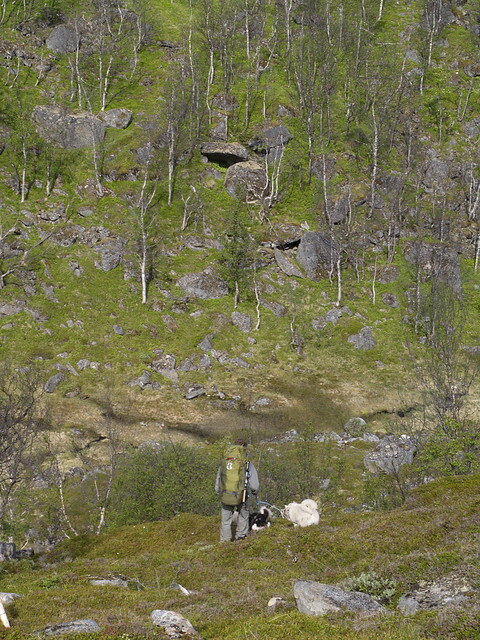 In front of us lies only a descent across vegetated hillside. Not my favourite but, tiered legs or otherwise, I resolve to enjoy it. 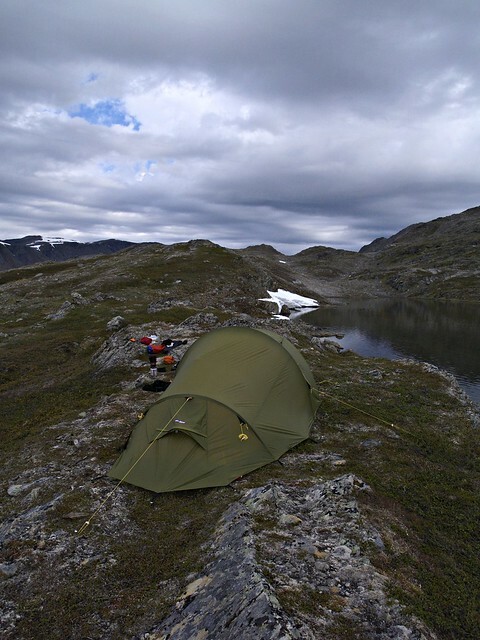 As we pass by a small group of lakes we see a small helsport lavvu pitched at the waterside. The first sign that we don’t have the island to ourselves. Nobody is home. We’re a long way into our fifth day and we havn’t seen another soul. That’s a rare and wonderful thing in this new Europe of ours. The last kilometre brings one more dog incident. As Randulf negotiates a rock step Thule launches forwards. No barking, no whining, just a sudden acceleration and the clinical application of all his strength through the leash. Randulf very nearly takes a tumble and only going to ground saves him a fall of a couple of meters. At first it’s not apparent what’s caught Thules attention. Having returned to composure, a few steps later we see the reindeer lolloping away, pausing to look back and check we’re not in pursuit. To me, uninitiated in the way of the Greenland dog, this is another lesson. These dogs, as cute as they look, are bags of muscle and hairsprung instinct. These are about as far from yappy terriers as the canine can get. A few minutes further and we’re at the car and still have a fighting chance of making the ferry. No time for reflection we throw the bags and dogs in the back and drive away. As I watch the island flow past the realisation hits me. This trip is at an end. It occurs to me to that I may never get another stab at Seiland, I may never get a look at that Glacier, the higher ground may never feel the tread of my boots. The whole is a familiar sentiment. After all there will always be more undone than done. Still it doesn’t pay to be greedy and, if I’ve learnt anything this time out, it’s that there's still reward when you leave your list of goals at home. As we round the next bend my focus turns to beer and hot food. After all, it’s been a long day. Dave this has been a wonderful report, deserving of a book in my view. The photos are excellent and the narrative equally so. There is always a certain sadness upon the realisation that a trip is over in the same way that there is an elation that the trip has begun. But we take away memories that will be with us for ever. Whilst I doubt I will ever get to Seiland, it will be in the back of my mind as a place to visit if the opportunity arises. One question, how would you change the gear you took on the trip? Thanks for a wonderful story. Roger, Thanks for teh compliments. Glad you enjoyed the report. Yes, Seiland is a little off the beaten track but I think it's probably more rewarding than the finnmarksvidda so worth the effort. As for gear, I wouldn't change much. The main thing would be the sleeping bag. I carried a PHD minim 300, chesen mainly becuase of teh drishell outer, but 300g down was too much geven the sun never set. The lack of zipper made regulating temperature that much harder. Clothing was just right but when your just comfortable with everything on then tehre's nothing in reserve. The Hagloffs Oz pully is great in the bag but less good on. I know a shell isn't for warmth but I think a rommier cut and stiffer fabric would help my down layer function better. The white box stove continues to impress but it doesn't seem to work as well with Norwegian rod spirit. Randulf had an Eta Solo on test and whilst I'm quite taken with the concept (burner, mug and pot all in one) that particular model has too many fiddley bits that are asking to get lost in the field. One of the new jet boils might make my list for solo trips of similar duration. I'm still happy with my boots (Hanwag Banks) and my Granite Gear Vapour Trial is still my first choice. I had a few extra kilos in the form of dog food and it coped impeccably. Mt biggest dilema would be the shelter. For the conditions we got I'd have been happy with a tarp and the tent Randulf had on test was serious overkill. That said I think I would still choose some sort of enclosed shleter again. Just don't know which one. Thanks Dave, it is the shelter challenge that is puzzling me for next year in Lapland. I would like to use a mid but bug protection is also on my mind. Much more thinking to do. What a wonderful trip Dave. Thanks for sharing it with us. Why not take a Warmlite 2C for your tent? 1205grams including titanium V pegs and tent bags. Oh and, yes nice shelters and a real possibility. You putting Wanda up for sale then? can you post a map? Josia, I'll see what I can do.